Columns specify what data from the accounts will be printed in the report. For account and ledger parts, and unless overridden by a cell calculation, each column contains one specific type of information such as the account code, description, or actual account balances or budgets. This is how you can identify the column in other column or cell calculations. 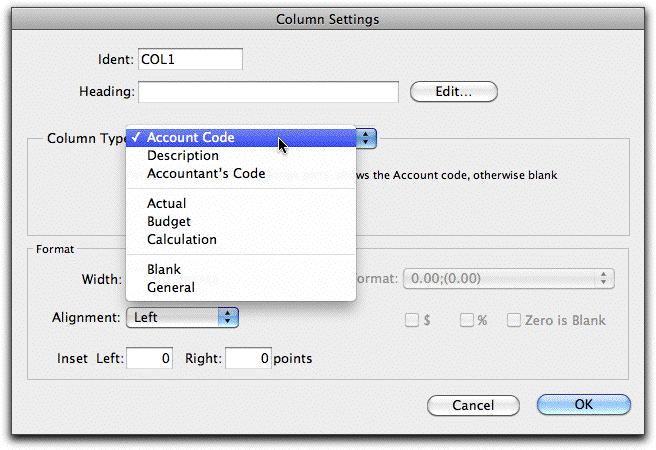 A default identifier name is supplied whenever a column is created. You don’t need to change this, but if you do you should ensure that you use a name that is not already used in another column of the report. The text in the heading is printed on the report whenever a column heading is printed (printing the heading is done by the Column Headings report Part, or by the various column headings Part options). This will normally be just text, but full expressions and report variables can be used in column headings. Clicking Edit will open the Calculation window, enabling the easy entry of expressions. To use a variable in a column heading, the heading must start with an equals operator, e.g. The variables Colper and ColYear show respectively the period name and the year name to which the column corresponds.